The following discussion refers to items found in the sub-menu Quote to Invoice >> Sales Orders. Proposal: A non-binding quotation for a sale, it provides a printable quote document but does nothing else. Quotation: A binding quotation, similar to the proposal but it reserves stock when it is prepared. Standard Order: Upon completion, creates a confirmed customer order that will generate shipment documents. (Prints an 'Order Confirmation'). Warehouse Order: As for Standard Order and creates and completes the corresponding shipment document. All goods must be in stock, as the created shipment is to fulfill the whole order. (Prints a 'Customer Shipment'). On Credit Order: As for Warehouse Order and creates and completes the corresponding invoice. (Prints an 'Invoice'). 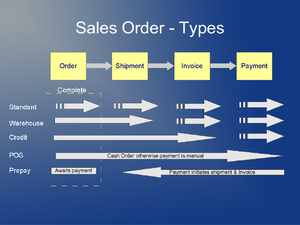 POS Order: As for On Credit Order and creates and completes (and allocates) the corresponding payment. (Prints a 'Receipt'?). Prepay Order: As for Standard Order and creates and completes the corresponding invoice. The shipment will only be generated once the invoice has been paid. Return Material: Currently broken. Intended to create a return material authorization for handling the receipt of customer returns. The Business Partner field is the partner who is receiving the order. Optionally, another partner can be invoiced for the order by changing the Invoice Partner field. Most of the other fields will default to those set in the Business Partner window for the chosen partner. A new business partner can quickly be created from a template by right clicking on the Business Partner field and selecting New Record. The Delivery Rule field determines the conditions under which a shipment is generated for this order. Availability will ship goods as they come into stock, regardless of whether there will be outstanding quantities for the order or not. Force will cause a shipment to be generated for the full quantities specified in the order, regardless of whether they are in stock or not. Complete Line will generate shipments whenever stock to fulfill any individual order line is available. Complete Order will create a shipment when the stock to fulfill the entire order is available. Manual will prevent shipments from being automatically generated. After Receipt requires the order to be paid for before the shipment will be created. The Invoice Rule field determines the conditions under which an invoice is generated for the order. After Delivery indicates that goods should only be invoiced as they are shipped, so partial deliveries will possibly split across multiple invoices. Immediate means the invoice will be generated in the next run of invoices after the order is completed. After Order Delivered will allow the creation of the invoice only when the whole order has been successfully shipped. Customer Schedule after Delivery will use the invoice schedule associated with the order business partner to determine when invoices should be created. Complete: Reserves stock and initiates any further document processes (for example, shipment and invoice creation for an On Credit Order). Document status is set to completed. Close: For a completed order, sets quantity ordered to equal the quantity delivered so far (thus preventing further shipments being created. 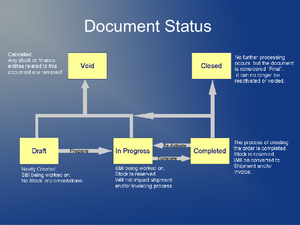 Document status is set to closed, which prevents any further updates to the order. Void: Sets all quantities to zero and document status to voided. Any automatically generated linked documents are automatically voided as well (for example, a Warehouse Order will have any shipments voided). Reactivate: Takes a completed order and changes it document status to in progress, allowing it to be edited. This will result in automatically generated linked documents being reversed. Shipment related windows and processes can be found in the Quote to Invoice >> Shipments sub-menu. Customer shipment documentation can be automatically created using the Generate Shipments process. All completed orders that match the entered conditions which have undelivered quantities will have a new shipment created according to the delivery rule specified in the order. Selecting the Consolidate to one document option will result in multiple orders for the same business partner to be delivered under the one shipment. If you only want to generate shipments for specific sales orders you can use the Generate Shipments (Manual) form to find and select the required orders. The Document Action field determines whether the newly created shipment will be completed immediately (which will update the stock levels as well) or just be prepared (which allows the shipment to be changed). Note that Warehouse, POS, and On Credit Orders will automatically create and complete the necessary shipment documentation upon completion of the order. The created shipments can then be accessed (and edited if not completed) using the Shipment (Customer) window, where new shipments can also be manually raised. It is possible to use a copy of the shipment document (perhaps with an alternate print format) as a picking slip for each shipment. Alternatively the Shipment Details report can be used to create a consolidated picking slip. Customer invoicing related tasks can generally be found under the Quote-to-Invoice >> Sales Invoices sub-menu. As with shipments, invoices can be automatically generated from sales orders according to the invoice rule specified in the order using the Generate Invoices process, optionally limited to a particular business partner or order number. Similarly, the Generate Invoices (manual) form can be used to select specific open orders for invoicing. Note that certain order document types will have automatically created an invoice upon completion (i.e. POS and On Credit orders) and so will not be available to create an invoice. This page was last modified on 19 January 2012, at 13:24.